Old World meets new in this handsome walnut cutting board. Old World meets new in this handsome walnut cutting board, handmade in Brooklyn by Nils Wessell. While keepsake cookbooks will always be cherished, many home chefs are counting on the internet to provide them with the perfect fra diavolo sauce or the proper way to fry plantains. 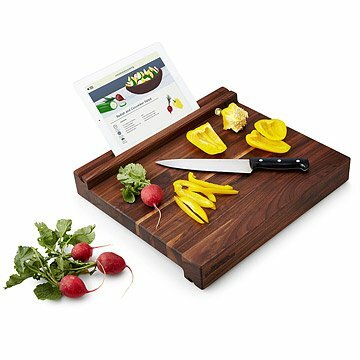 Sturdy and double sided for a variety of prep needs, each side offers a slot to hold your iPad, so you can chop and slice with your recipe--or even your favorite cooking show--in front of you. Head over to our blog to meet Nils Wessell and learn more about his process. During his childhood, Nils often made replicas of the dragon in Ruth Stiles Garrett’s My Father’s Dragon series. As the years went by, this evolved into a desire to make art. The “language” he would use in art making was highly influenced from his summers in Vermont, where he’d spend his days with his uncle and grandfather – two woodworkers and serious DIY project addicts. They introduced him to the basics of construction. With their hard work, a property from a barely inhabitable summer cottage transformed into a compound complete with a barn, a pond, an in-ground pool and two three-bay garages. Using this knowledge at Bard College, where he majored in Studio Arts, he practiced his construction skills by making large-scale sculptures and architectural installations. He has continued to work with wood and although his toys and tools have improved, in many ways, he remains that kid drawing and hammering, excited to keep working. Head over to our blog to meet Nils Wessell and learn more about his process, or check out our Studio Tour. Coat with mineral oil as much as needed. Clean with a 1:1 ratio of vinegar and water. Help condition and preserve your board with mineral oil. This is really attractive with special features like the no slip hold on my counter and the slot for the recipe. This product is fantastic! Easy to use and so convenient. Not only is the design beautiful, but the board itself is sturdy, and timeless. Highly recommend.